Black Panther has landed seven nominations and has become the first superhero film to get a Best Picture nomination in Oscar's history. This nod will see it compete against BlacKkKlansman. The Spike Lee film gets Best Director, Best Actor in a Supporting Role (Adam Driver), Best Adapted Screenplay and Best Original Score and Best Picture. 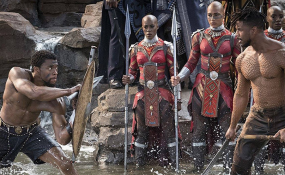 The all-black cast film which raked in over $700 million in 10 days not only put Africa on the spotlight, it was seen as a form of identity for blacks all over the world. How the hell is Black Panther nominated for best picture when it's just a mediocre super hero movie. One of the most overrated movies 🎥 this generation. If the Dark Knight couldn't even get nominated, Black Panther shouldn't even be in this discussion.